Personalized princess backpack. 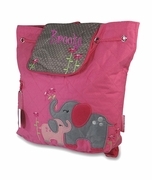 Every little girl will love to carry this lavender and pink embroidered princess backpack with monogrammed name. Perfect to carry all their princesses, fairy tale books, crown and wand. Take it to play dates, story time, or grandmas. 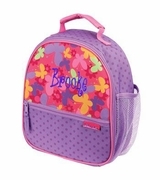 The personalized princess backpack measures 13"W x 12"H x 4" across bottom. Lined with cinch rope top and snap closure. Mini outside zip pocket, backpack straps or hand carry.